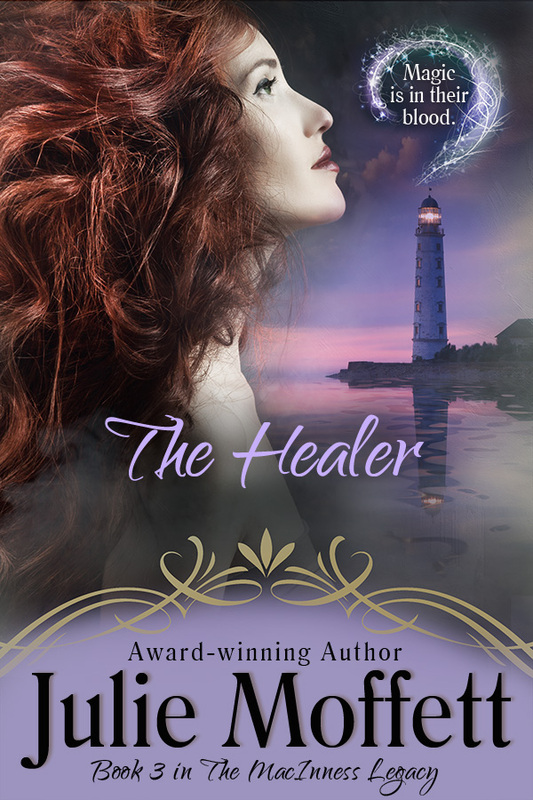 The Healer . . .
A thick shawl of mist descended on the wooden cottage against the stifling gray of the sky. A heavy chill hung in the air, weighing down the gnarled trees and impenetrable brush that surrounded the structure like a fortress. No wonder only an adventurous few in Salem ever dared traverse the path to its door. This eve the fog made the journey even more treacherous. The mist was both an unexpected and unwelcome guest, stirring eerie shadows past the young girl who stood trembling on the doorstep. She’d been here many times before, but she knew tonight would be different. Drawing a breath of the air, she summoned her courage and pushed open the door. She stepped across the threshold and paused, letting her eyes adjust to the dim light. After a moment she saw the old woman sitting in a rocking chair in front of the blazing hearth, her back to the door. The chair creaked as it moved, the sound creating a strong and compelling rhythm. A warm fringed blanket had been wrapped around the woman’s thin shoulders and a pale ribbon of moonlight threaded across her silver hair, making it shimmer. Although the sight seemed innocent enough, the girl felt a cold chill race down her spine. The girl hesitated only a moment before stepping further into the room, her heart pounding. There were no candles ablaze, no light except for that provided by the fire. Reverently she approached the rocking chair and stood directly in front of the old woman. She managed not to flinch when the woman reached out a gnarled hand and grasped the hood of her cloak, pushing it off her head. Her copper-colored hair spilled onto the woman’s hand, the reflection of the fire dancing off the mass of curls. The woman fingered a few of the strands and then lifted her gaze. Hannah nodded although she did not fully understand. For all her three and ten years, she’d been preparing for this moment. But now that it had come, she feared she hadn’t prepared enough. She removed her cloak and knelt by the rough skirts of the seated matriarch. Hannah’s pulse quickened, but she kept her expression calm. She rested her cheek against her grandmother’s bony knee. The old woman stroked her hair quietly for a moment. The girl lifted her face and studied her grandmother’s face. Though her skin was translucent and wrinkled, the cheekbones were delicately carved and proud. Remarkable emerald eyes both mysterious and intelligent, peered at her, sharp and assessing. In fact, as soon as she’d crossed the threshold of the cottage, she’d had a feeling that she’d already lived through this night. It unsettled her because much of what had already been said and done this eve, she’d relived many times over in her dreams. In one such dream, she sat in front of a blazing hearth at the feet of her grandmother, just as now. Except then, the fire was a malevolent force, hissing and issuing a thick writhing smoke. As she watched in horror, the flames swelled into a grotesque beast that opened its fiery, gaping jaws, intending to devour her whole. She would awaken screaming, her bedgown soaked. Even now, the thought of it caused her to tremble.